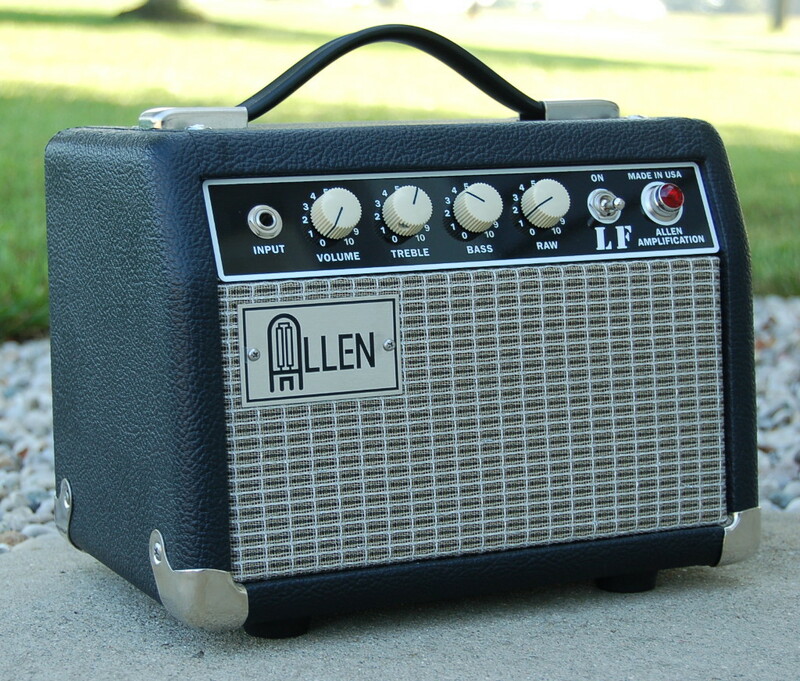 Allen Model LF amp. When size and weight matter as well as great tube tone, the Model LF 1x8 combo delivers. 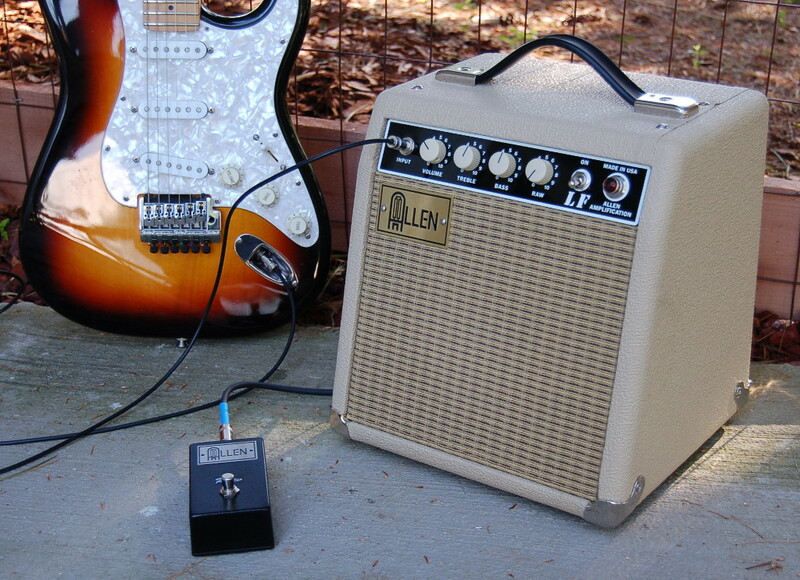 At less than a cubic foot and 20 pounds, this versatile little amp has a full EQ section, the ability to accept either a 6V6GT power tube for 6 watts or a 6L6GC power tube for 10 watts, and a unique foot switchable RAW control to go from scooped mids blackface tones to flat mid-rich tweed tones and beyond. The Model LF features a switch on the back to set the correct bias for each type of power tube and a unique speaker jack for each type of power tube to ensure correct impedance matching. Also on the back is the 1/4" foot switch jack for switching the RAW feature. 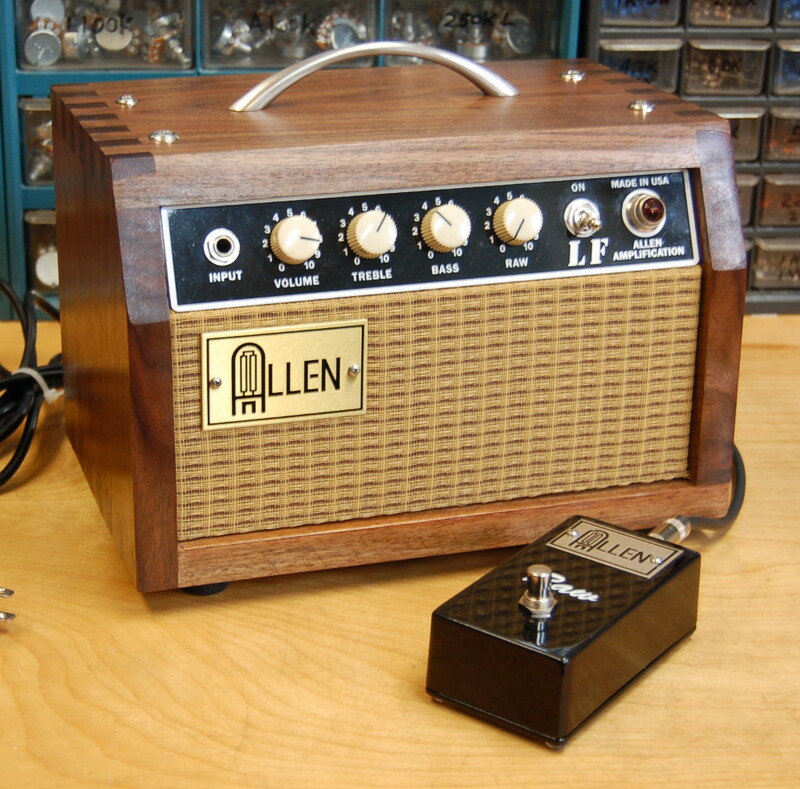 A new ALLEN Raw foot switch pedal is available or use any 1/4" shorting pedal you may have. The Model LF is great for driving larger speaker cabinets. Takes pedals well and is very quiet due to the extra filtering stage used. Use it for practice (with our without the band), recording, or even small gigs or where you can mike it. Use two for stereo rigs. With a 12AU7 preamp tube installed, it is a great little harp amp, too. "It is small enough to take anywhere you could take your guitar but big enough when you get there!" 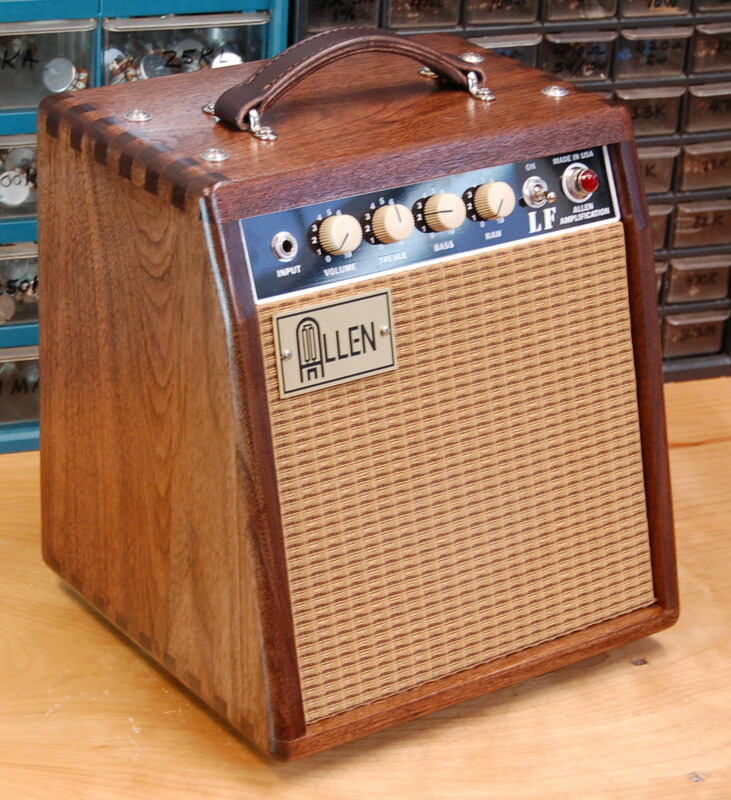 "Allen has successfully cracked the code when it comes to low power amps that typically offer little headroom. Not so with the "LF" model. The amp delivers usable clean headroom and tones that are bright, with enough low end bass response to make this amp and speaker combination very usable for rehearsal and recording. The LF impressed us as being completely unique in the world of modern amps. Its voice is rich and full and you get plenty of clean headroom from the optional 6V6, 6L6 or EL34 power tube. The bass and treble controls are both responsive and effective, and the LF also has a very good overdriven tone with excellent distortion and breakup using the supplied RAW pedal that plugs into the back of the amp. The overdriven tone with the raw pedal is outstanding and fully adjustable via the raw control at approximately 10 watts. Clarity is excellent and the overdriven tones are pristine with exceptional sustain. The RAW pedal is the secret sauce for this amp. For those of you for whom volume and weight are a concern, we recommend the Allen LF highly as a real solution for low volume amps with tone, headroom and an excellent dose of truly musical distortion and sustain. Highly recommended!" 6 watts with a 6V6GT power tube or 10 watts with a 6L6GC power tube. (1) 12AX7 preamp tube and (1) 6V6GT or 6L6GC power tube. Treble and Bass controls plus Raw mid/gain boost control. U.S. made TP24 power transformer and Heyboer TO11S output transformer as used in the Chihuahua and Classic 10 amps. A maxed out tweed/blackface Champ with 6L6 option and a foot switchable mid/gain boost feature. Power tube is cathode biased so there is no adjustment required. Finger-jointed pine cabinet is deeper and with special back panel to improve the bass response of the amp. The baffle is angled for better projection from the floor. Many Tolex and grill cloth options available. Warehouse Guitar Speakers G8C 8 ohm 20 watt ceramic magnet speaker. Optional Celestion Eight 15 speaker. RAW mid/gain boost control on front is foot switchable. Allen RAW foot switch box available or use any 1/4" shorting pedal. 1x8 Combo - 12"W x 12"H x 10"D. 20 lbs. Head - 12"W x 8"H x 8"D, 15 lbs. 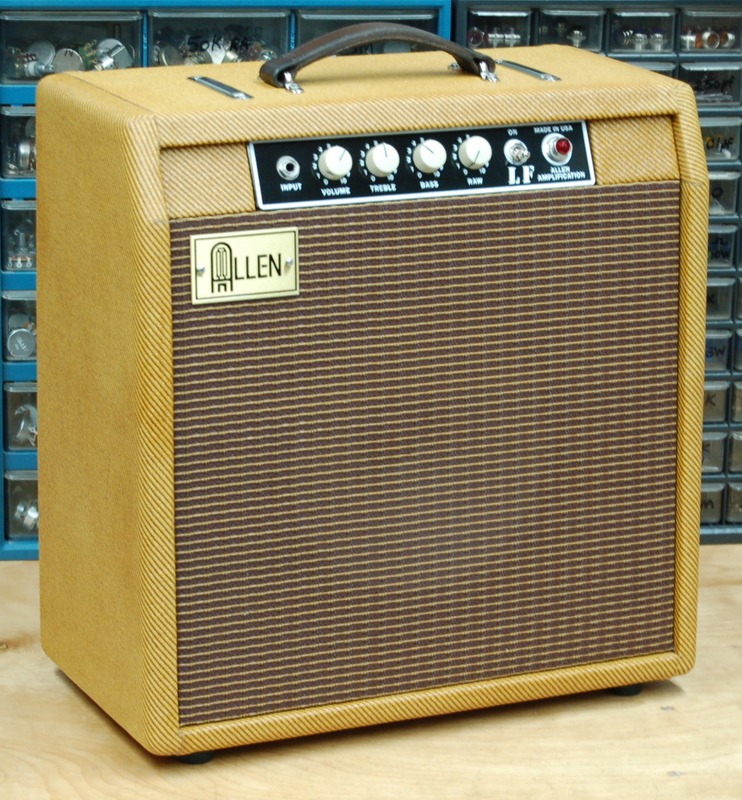 Tony Sims checks out the Allen Model LF Combo amp.